Reptilia will release a new set of micro red dot optic mounts, the ROF45 and the ROF90, crafted as a drop-in upgrade for magnified scope mounts. The ROF45 and ROF90 will initially be provided for Geissele’s Super Precision 30mm scope mount, introducing a mounting point for miniature reflex sights for quick transitions to close-range targets. 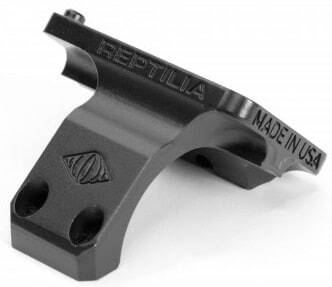 Reptilia says shooters can swap between a top-mounted optic with the ROF90 and a 45-degree offset cant on the ROF45. Made from billet 7075 aluminum, the mounts are further protected with Mil-Spec Type III hardcoat finish for durability. Both mounts can currently able to accommodate a Trijicon RMR or Leupold DPP. Reptilia says the ROF45 and ROF90 will be available come April 2018. No word yet on price.